So I did. He received this cute little stack of envelopes on Christmas. 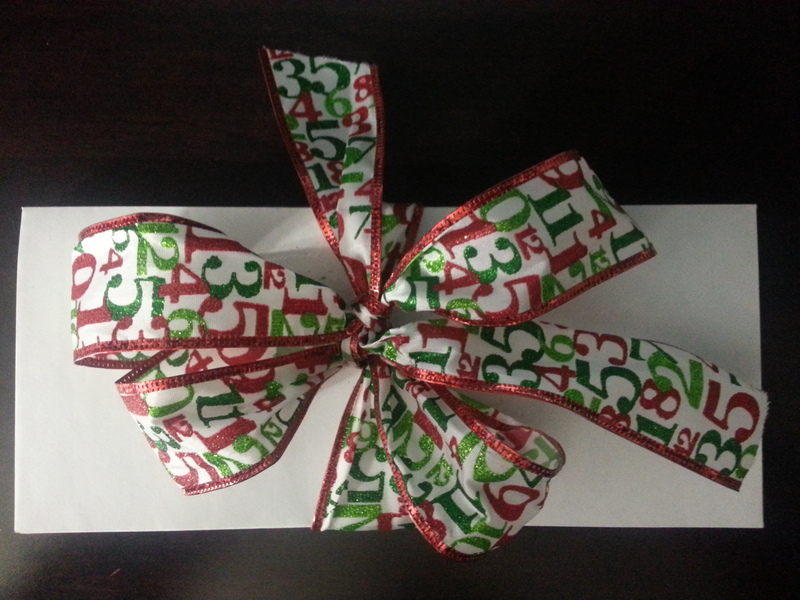 I found a fun number ribbon at Michael’s to wrap them in a bow. I thought it was a fun representation and play on the “dates”. He loved the idea! My husband loved getting a year of dates. This is how he received the gift. 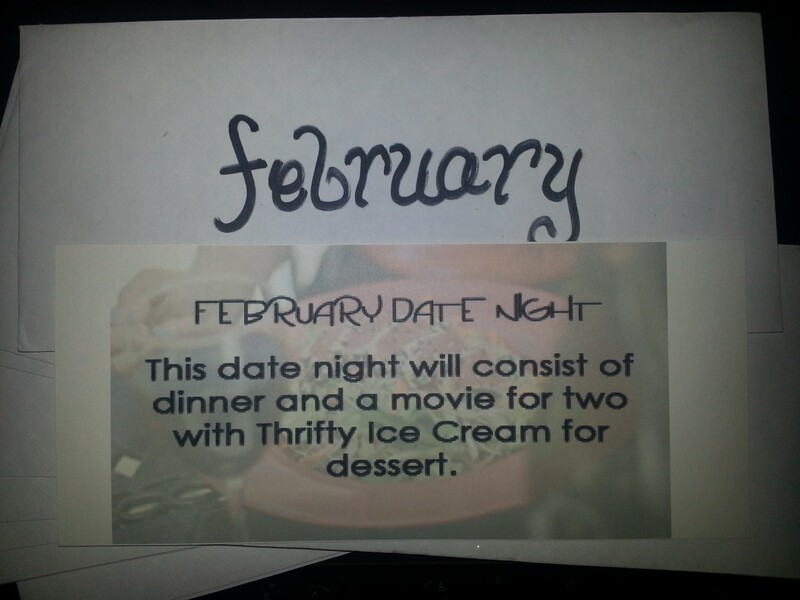 The first thing I did was write down 12 date ideas – one for each month. I really thought about some things we could do that were unique and different. Some are a little more high end, others are inexpensive but require time to prep, and others are middle of the road. If you need ideas, check out my post on Dating Ideas for the Married, or Not Married Couple. You can find tons of inspiration that you are welcome to use or may spark ideas of your own. 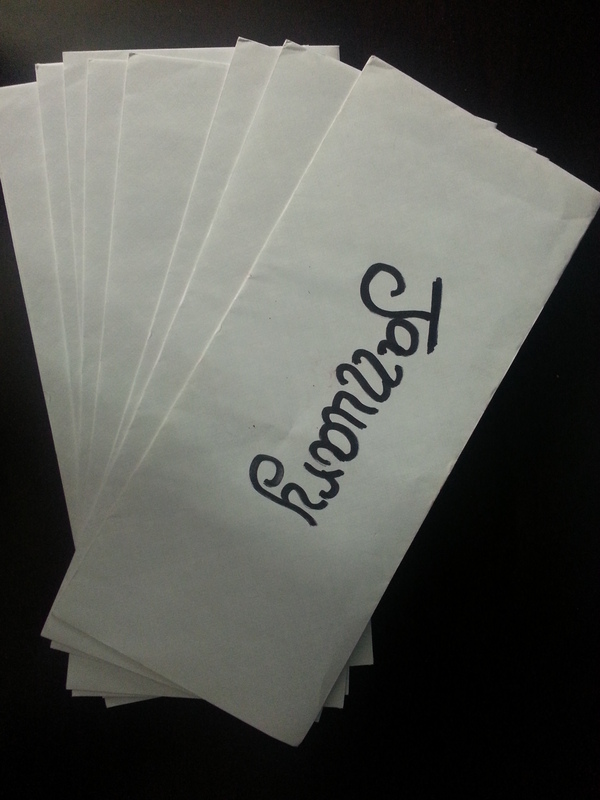 Next, I labeled 12 envelopes with a month of the year. I choose to do this by hand but, you can print them off your computer as well. You need 13 envelopes. One for each month and one for the letter of instruction. Next I went graphic…as in I took my Photoshop program and made 12 envelope letter sized cards that said what the date was and gave a graphic representation as well. I put three on a piece of card stock to save paper, cut them and stuffed them in to envelopes. Each envelope has a different date he will get to enjoy. 2. Each month, on the first of the month, when we are together you may open an envelope and will get all the details. 3. We will choose an actual calendar date together. At the end of the year of dates on January 17, you will receive a scrapbook with all our dates. I hope you are excited! I wrote him a letter of instruction so he wouldn’t peek ahead. 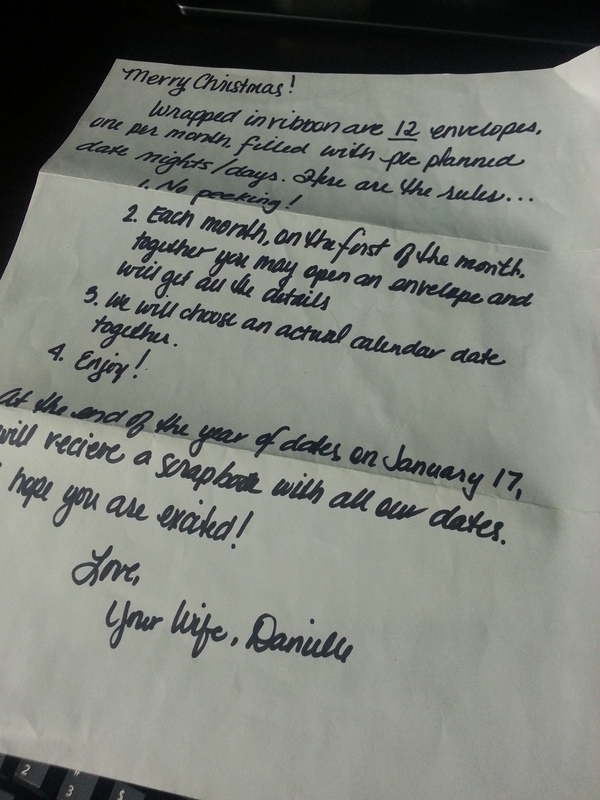 I stuffed this letter into an envelope and slid it on top of the others so January was not showing. You can either give this to him as is or you can wrap them up. Either way, he will love the idea. And for those gentlemen that read my blog, I can’t think of a woman alive that would not LOVE to have you do this for them and you can even scrapbook it on Shutterfly with their plug and play templates. If you choose to use this idea, I would love to know what your significant other thinks! What an absolutely clever idea! Pingback: Planning an 80s Prom Party | Wife, Mom, House...Oh My!